Students create an interview with a book character to engage more deeply with a text and demonstrate comprehension. Getting to know a character and their point of view is essential to interpreting events and voice in the books we read. To show how well you know a character in a book you are reading, you will craft a set of interview questions for a book character along with their answers to demonstrate that you understand the character’s traits and motivations and how they experience events in the story. Let your students know they will be conducting an interview with a character from a book they are reading. Be sure they understand they will need to come up with the questions to ask as well as the way in which the character will respond. While they will write the questions and answers, they will share the interview through a video or slideshow they have created. If an expert came to your class and students asked them questions, discuss this shared experience as a whole class. Be sure to note or highlight questions and answers that were the most memorable. If you haven’t shared an interview experience as a class, talk about ones they have seen in the media and watch an interview online, such as the one below with author Carl Hiaasen. Depending on your goals for student work, assign students a book character to interview or let them choose a character from a story they love. Let students know that before they jump into creating the questions and answers, they need to identify what they know, find additional ideas and evidence in the text, and begin organizing their ideas. The more they understand the personality, motivations, and actions of their character, the easier it will be to craft a fictitious interview that showcases this information. You can use graphic organizers, such as a character traits cluster or a 5 W’s organizer, to scaffold student research and ideation. A cluster diagram that includes evidence from text to support their thinking is especially useful when crafting the character’s answers to interview questions. You might also ask students to reread the story and complete a double-entry journal to take notes on the selected character and events that take place. Be sure the student can articulate the theme the author is exploring so that they can craft questions that explore this theme. The actions of their character are also a great place to look for the theme of the story. For example, if a character stands up for a friend, we can infer from their actions that friendship and courage are themes explored in the text. After students have identified traits for their character and themes in the text, they need to begin crafting the questions they will ask their character during the interview that reflect this information. While you can provide students with questions, you can give them more agency as learners by asking them to craft their own questions. If students have chosen different titles on their own, the questions need to be unique to reflect the unique characters and events in the books they have chosen. Our education system is based on the getting the answer right, not asking questions, so your students may need some help formulating questions. You may have used the 5W’s as part of student’s research and evidence gathering. Start this process by asking your students to write full questions that begin with who, what, when, where, and why. "What did you think about... ?" "How did you feel when... ?" "Why did you decide to... ?" If you haven’t already watched a sample interview with your students, now is the perfect time to explore how an interviewer gets an interviewee to share information that is relevant and engaging. Ask students to write 6-10 questions for their character and then share and compare them with a critical friend. Ask each pair to share an idea from their discussion that they think will be beneficial to the other students. Students should edit their list of questions to a final set that you can review before they begin working. This is a lot of work on your part, but ensures that students ask questions that challenge their thinking and require effort at an appropriate level for each learner. Have students write answers for each of the questions as if they were the book character. Encourage them to use quotes and evidence from the text to demonstrate close reading and comprehension. While a text document serves the purpose for assessment, it isn’t very fun to craft as a student. Use a video program or animation tool like Frames, or a presentation tool like Wixie, to create scenes for each question and actually record student voice asking questions and responding in character. Have students present their interviews to the entire class, or if several students chose the same book, have them share their interviews with this smaller group of students. Celebrate the work of each student, but don’t just ask the students who created the project to do all of the work. Use the opportunity to get all students to share their thinking about effective ways information was communicated by comparing the styles and content of each of the interviews. 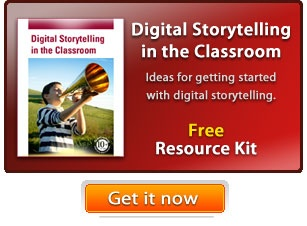 Invite your school librarian or media specialist to the presentations. They may also be interested in sharing student work from a station in the media center as a way to get other students interested in reading books that include these characters. Listening to students discuss their ideas and opinions about the texts is essential to supporting their comprehension and work. The graphic organizers and other supports students use during the process also provide tangible opportunities for formative assessment you can do without students being present to identify where learners are having difficulty with comprehension and to determine if you need to provide additional individual or whole group instruction. Use the character interview performance task as a summative assessment that evaluates a student’s comprehension of the story and their skills in communicating information and ideas from it. Create a rubric or checklist to help guide student work as they build the final interview.